The article “Wham! The Final Story was written by Deborah Law and published in the Tiger Beat Star magazine on November 1986. 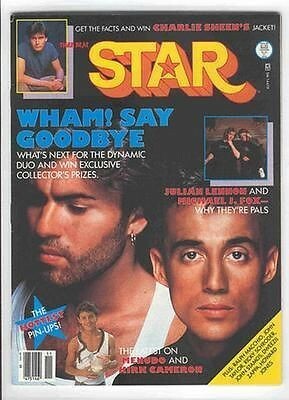 STAR: Why split up Wham! when you are so successful? GEORGE: It wouldn’t have been worth doing it just for the sake of doing it, whereas the actual essence of the group is over really, because the most impressive thing about the group really is, was that total kind of freshness. It was an idea we always had, more an idea than a group or band and once the actual idea started to sound tired then the records will follow shortly. I think basically it was just a matter of you know, quitting while the going was good. STAR: Andrew, you knew nothing about the split or did you? STAR: Did it make you angry Andrew? ANDREW: I wasn’t miffed at all, you know, because it is George’s decision and George is free to say what he wants to, and do as he likes. The lawyers asked me to makes a decision rather more speedily than I would have liked, but I said that I wasn’t going to make that decision and I made it in my own time after I had thought about it, so I wasn’t miffed. GEORGE: With the two of us, when you talk about our past, people want to find huge contrasts, like Andrew was the trendy boy in the class and I certainly wasn’t (laughs). In terms of personality we were pretty similar, both fairly loud and that’s why we got on so well, both kind of class jokers. I don’t mind being painted as a short, fat, spotty, fourteen-year-ol d with glasses because basically that is what I was. GEORGE: No, I wasn’t short, I was taller than you, I’m shorter than you now. I read an article saying I was someone no one would have missed, with a description that I was someone who sat in a corner in a classroom, until Andrew came and rescued me. Even though it is history I do dislike the idea of being called an outcast at school. STAR: Did you play your jokes together? GEORGE: Yeah, until we were separated by different subjects, you know, like at O level stage – Andrew did needlework and typing (fits of laughter) and I just wasn’t into it. STAR: Were you rowdy kids? GEORGE: I was pretty loud, the pair of us were loud. When I say loud, we wanted to make everybody laugh; trouble is, everyone laughed at me even when I wasn’t trying!! STAR: Andrew, why do you have such a bad reputation? ANDREW: I am 23 now but I’m talking about when I was 21/22. When you go out, if you look at any 21/22 year-olds on a Friday or Saturday night they are having great fun and I was doing nothing different to any of the other 22 year old males around the country. It is as simple as that really. I enjoy having fun and I enjoy myself when I go out. ANDREW: I had no preconceptions about China, I can honestly say that. I didn’t know what to expect and I didn’t expect anything, it is a dreadful place. It is crushing, the whole atmosphere about it is crushing. When you begin to understand China and the mentality that is imposed upon the people, it is just not a nice place to be. There is an overall suppression of thought… not that we got to sepak to any Chinese, but some of the band members did, they had interpreters who expressed real views, but they were not allowed to speak their minds and they were afraid to speak their minds. STAR: Andrew, do you want to be in films? ANDREW: I would like a part that is something larger than life, a character that doesn’t exist other than on the screen! GEORGE: At one point there were genuine WHAM! film offers. We could have made one and made an awful lot of money, it would have been dreadful – (laughs) the worst film ever. ANDREW: I’m not playing a bloody pop star in a film, how do you play a pop star? You can’t, there is no such thing. There was an offer from Miami Vice, I spoke to the producer, but I don’t want to do that. ANDREW: I’ve seen the parts they get on Miami Vice and it’s ludicrous. ANDREW: We don’t know this yet, that is something I have to find out for myself. I will go and see a tutor. I will be going to Los Angeles at the end of this year to speak with the people to see if there is a role next year. When that happens, if it happens, I will go to a tutor. GEORGE: Oh definitely, we did build our dream to a degree that we went beyond what we thought we could achieve and we are very, very glad that we achieved it. You know, it is so cut throat, the business is so cut throat and at the moment you have got to stay right on top or you are not there anymore, and it’s just like… we don’t want that to happen. There has got to be a time when we are not making number one records anymore, so why not just cut short now. The date is Saturday, June 28th and it must be one of the hottest days of summer. The sun is smiling on WHAM! The most loyal fans begin to arrive very early in trying to get a place at the front of the stage. It is a case of first-come get the best places. At 10 a.m. a black limousine arrives at Wembley Stadium carrying George Michael and American girlfriend Kathy. They first go to their dressing room in a mobile caravan and then George leads Kathy onto the empty stage, to look out across the huge empty arena, which in four hours will be filled with 72 to 80,000 fans. An hour later Andrew arrives in a limousine with girlfriend Donia Fiorentino and they follow the same procedure. Shortly after noon Elton John and wife Renate arrive in their Bentley and hold a party backstage. Elton has had a swimming pool built for just today, next to his mobile dressing mom. The pool is 15 ft long and cost him £15,000! George is watching them run to the stage in his dressing room, on the television that he has installed because he doesn’t want to miss a moment of the day’s events. Andrew takes a dip in the pool and the sun must be about 90 degrees. 4:03 p.m. Gary Glitter storms onto the stage, wearing a gold coat. The hose pipes come out to keep the fans cooled. George gets sister Melanie to wash and blow dry his hair. At 5: 10 p.m. Nick Heyward jumps on stage with Haircut 100, the girls start screaming. Backstage the celebrity enclosure is filling with guests… Simon Le Bon and wife Yasmin, Paula Yates, Frankie Goes To Hollywood, Rod Stewart, Patsy Kensit, Spandau Ballet. 6:15 p.m. and it’s time to see some of the “Wham In China” film, on the two gigantic video screens, either side of the stage. Screams fill the arena each time we see either George or Andrew. When the Chinese speak we can read in English what they are saying, they seem quite amused by these two boys called Wham! George is having a massage and wearing only a skimpy towel, hands kneading his flesh; it is too much for some of the fans and they begin to faint. Bodies are being carried over the crowd’s heads and to the back of the stage. Shortly after 7:30 p.m. the band strikes a note and we hear “Everything She Wants.” The huge black curtain with “THE FINAL” written across opens and then we see George strutting on stage with two male dancers, they move and dance across the stage, the screams of the fans can be heard for miles across London. More girls are fainting. Five minutes later Andrew struts on, followed by backing singers Shirley and Pepsi, he starts to slowly strip and off they come, the black gloves and overcoat-bras are being thrown from the fans, the hoses are put over them again! The show is on and nobody is sitting, but standing, dancing, singing and clapping. An hour later Elton John appears on stage dressed as a clown and sings two songs with Wham! David Austin makes an appearance and George tells us that they used to hang out together in London seven years ago. At 9.40 p.m. they leave the stage, returning for three encores. The last encoure is “I’m Your Man,” and who is this running on stage? Simon Le Bon in his denims, the screams are louder and more girls faint, it is all too much. George puts his arm round Simon and they sing together, then Elton joins them on stage. Pink and blue fireworks are going off above them, coloring the sky, what a picture, what a way to go. George hugs Andrew and with tears falling rushes from the stage and it was, as he said “The best day of my life… so far.” Goodbye Wham! The party afterwards at the London Hippodrome is the most expensive ever, over $50,000. It looks like a snow palace, everywhere there are white silk sheets, thousands of balloons, artificial snow. At 4 a.m. the Wham! boys go their separate ways… America, here we come!